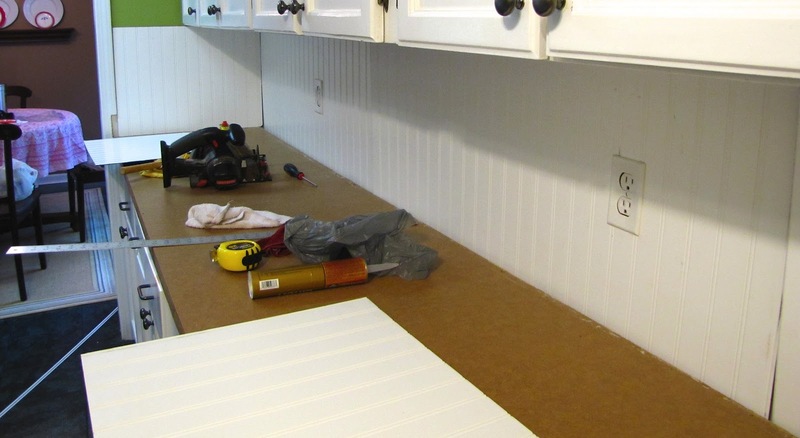 So I thought it was about time I put together the tutorial for the beadboard backsplash I put up in the kitchen. It was a semi-easy and inexpensive way to brighten up the space. 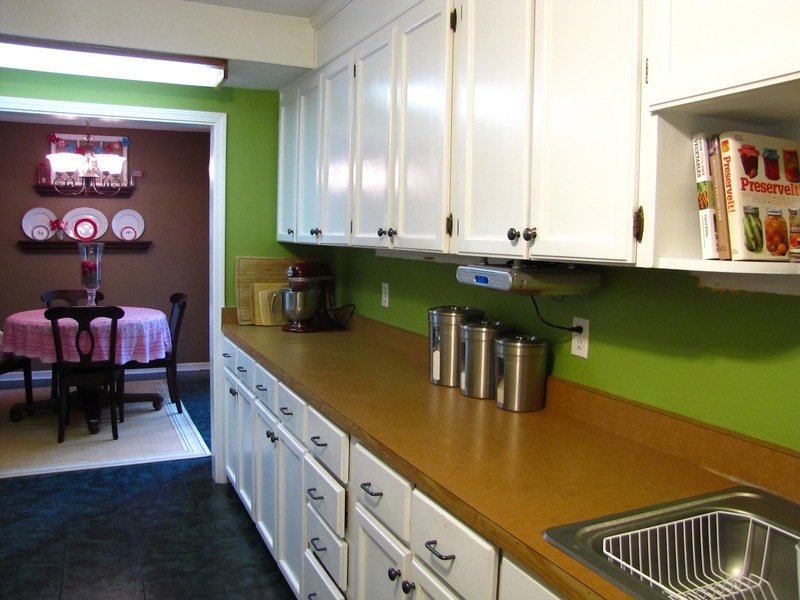 Below is a before picture of our kitchen. Well, actually this is an in progress picture. When we first moved in the hardware was yellow and was centered in the middle of the cabinets. We filled in all the holes with wood filler, sanded, primed and painted them. 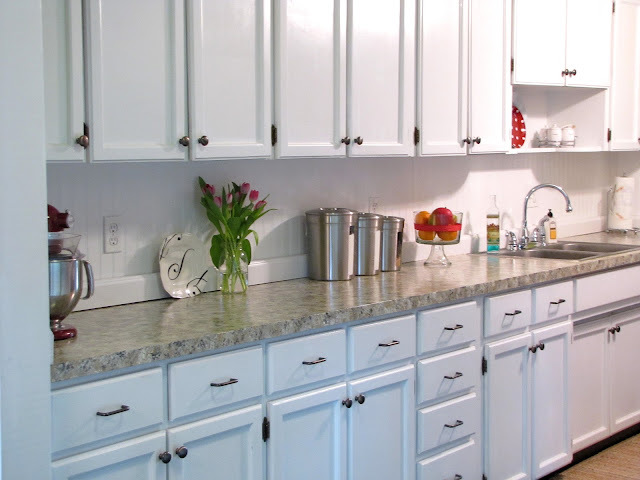 We replaced the cabinet door hardware with oil rubbed bronze knobs (similar to these) . I would like to replace the hardware on the drawers sometime soon with something a little different. But I love the finish of them so that won't change. We don't get a ton of natural light in here so it was in desperate need of some brightening up! I had Matt's dad help me take out the ugly florescent lights from under the cabinets. 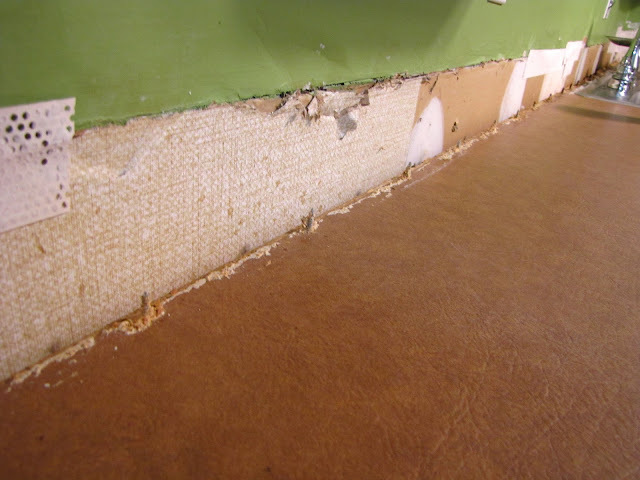 Then I took a crow bar and got to work ripping out the backsplash. Beautiful sight right? I had to unscrew all those nails from underneath the cabinet and the ones I couldn't get to I hammered down. 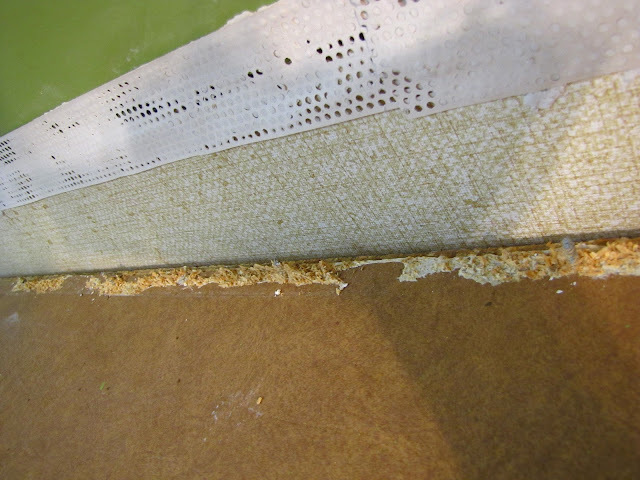 Then I scraped off the pieces of wood particle that were left from the backsplash and sanded it smooth. I fixed the places in the wall that had gotten ripped from the backsplash extraction. 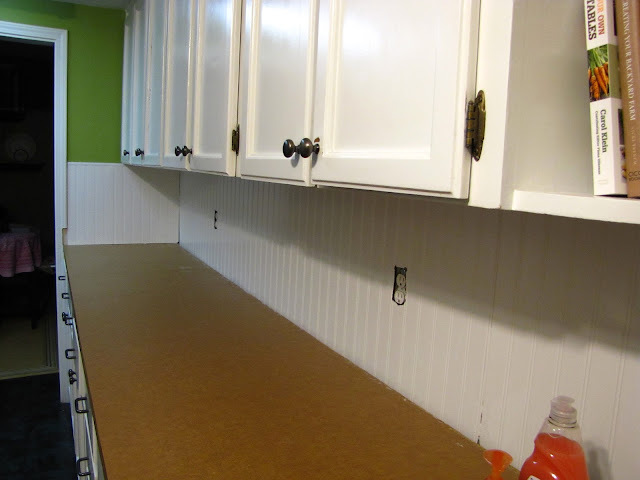 So once everything had been prepped I measured the space between the counter and the bottom of the cabinet and the length of space that would need the beadboard. I took my measurements to Home Depot and they cut the pieces for me. So much faster than doing it myself! 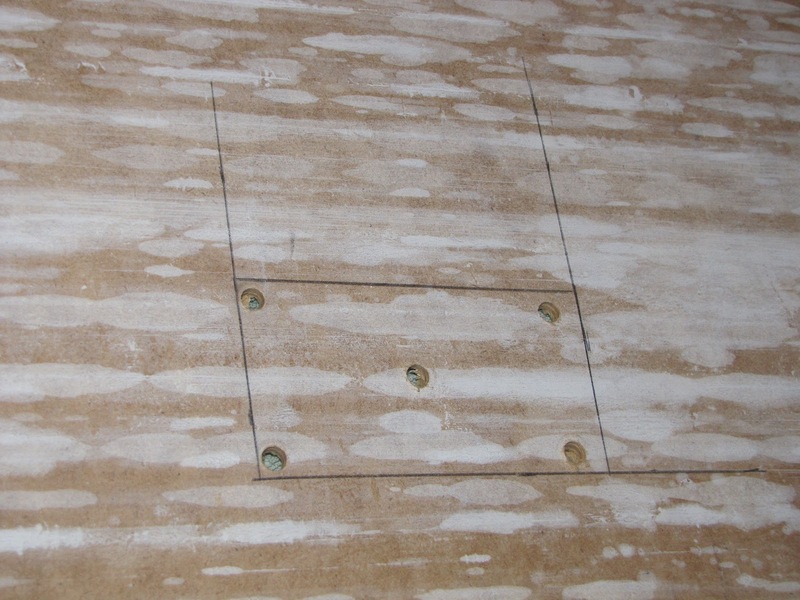 I measured where the outlet holes needed to be and drew them out with a pencil. I piloted holes into each of the corners using my drill. 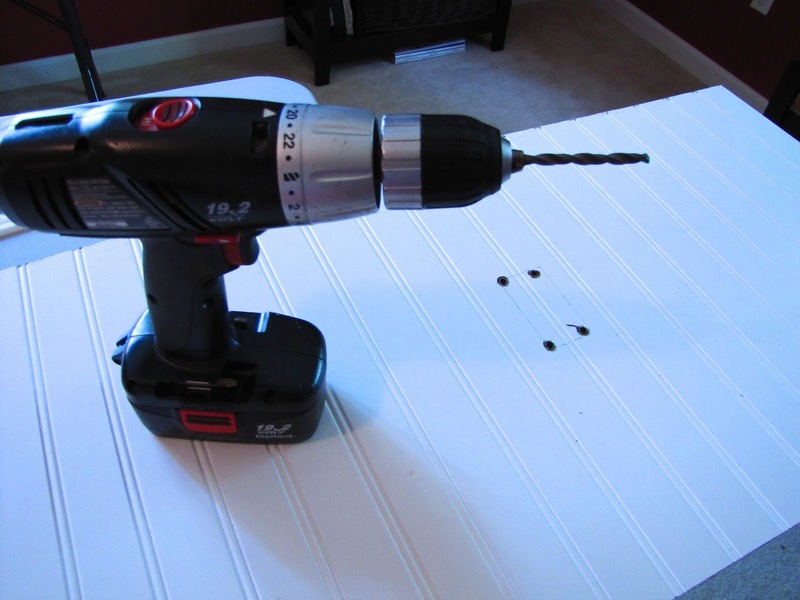 I used a jigsaw to cut out the holes. After all the holes were cut out I used liquid nails to attach the beadboard to the wall. I used small white nails to secure it a little more just placing them in a few places around the edges. Matt's dad raised the outlets a little for me so they would be level with the beadboard. I caulked around all the edges and where I pushed two pieces of beadboard together and then painted everything with a couple coats of bright white. 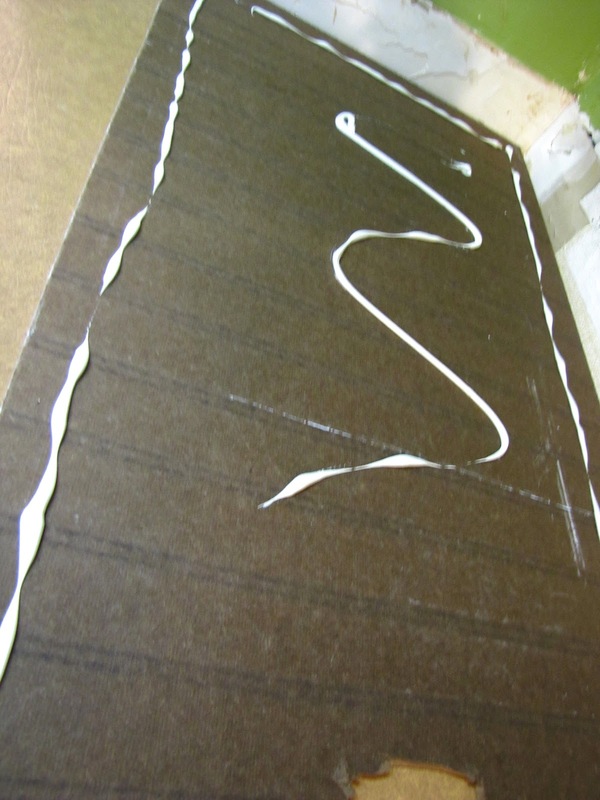 Because my countertops were not flush with the wall I had to use a thick baseboard to cover up the space. Matt's dad helped me add a small piece of wood to the back to make them thick enough to cover it completely. I didn't attach the baseboard molding to the wall right away because I wasn't sure what I was going to do about the counter at that time. 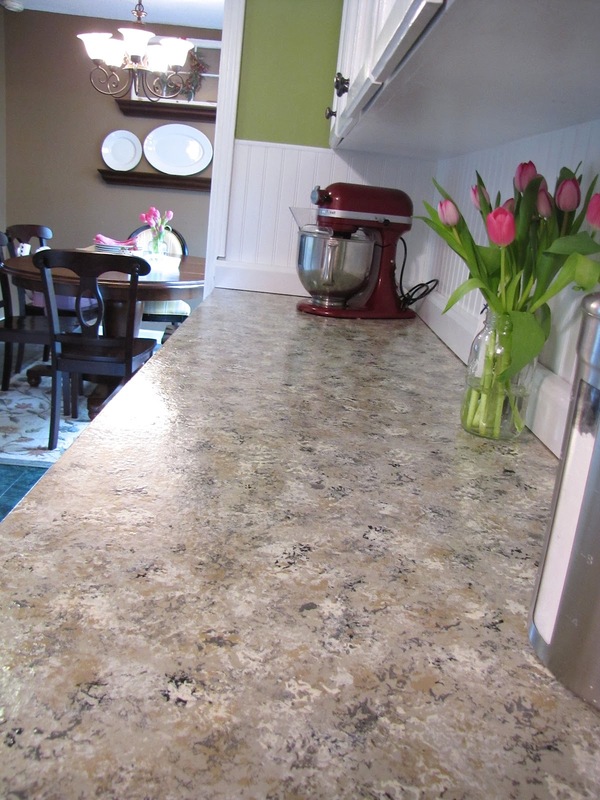 I decided to paint my countertops to look like granite. You can check out the details of that in this post. I just finished painting the kitchen walls and will show you as soon as I finish up with a little accessorizing. The other half of the kitchen is almost finished so I'll post pictures of that also. I've got lots of projects I'm working on this summer and will try and post as much as I can! Thanks for reading! I'm linking up with a few of these parities. Check them out! I have a beadboard backsplash on one side of my kitchen, and we love it. It looks so bright and fresh now - don't you love it?! Thanks for the tutorial - we have been thinking about doing this in our kitchen and appreciate your post. Your kitchen looks great! Your kitchen looks amazing! 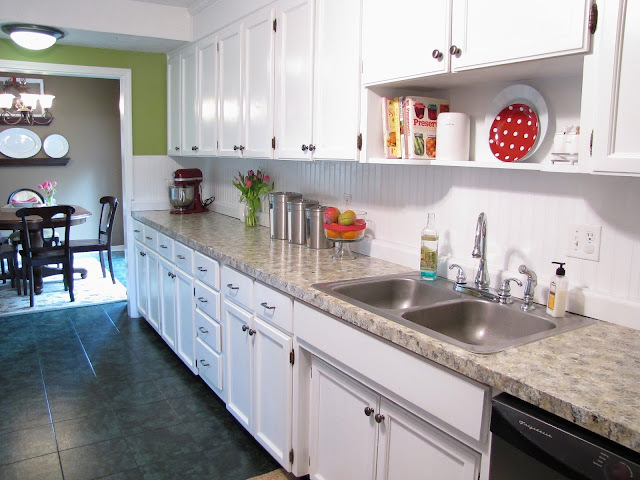 I love the beadboard backsplash - so smart! Thanks so much for sharing at Mom On Timeout! WOW! 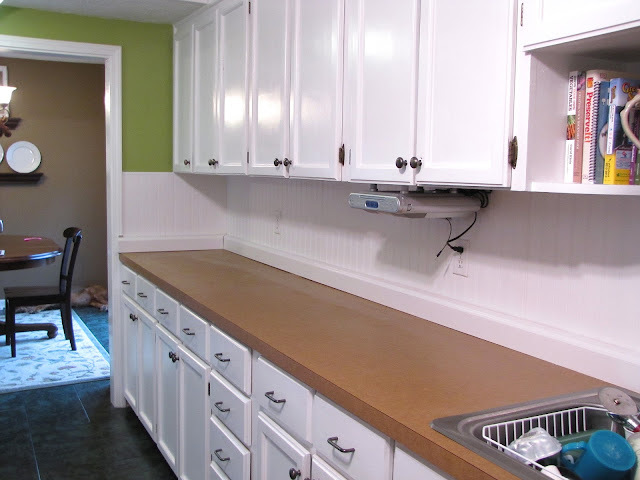 I just love EVERYTHING about this project, esp the bead board, which I'm addicted to. Bookmarking this project... when $$$ allows and it's time to get back into my kitchen, definitely doing this. Wow! Beautiful job! 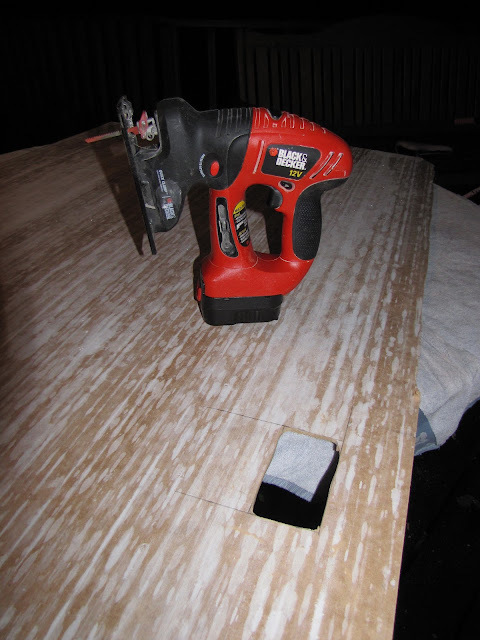 I love beadboard and using it for the backsplash was a great idea. It's so pretty! Love it! I'm pinning this for future reference s I think I wasnt to replace our tiles with beadboard. Thanks for the grat tutorial! I can’t believe how simple you made this makeover look! 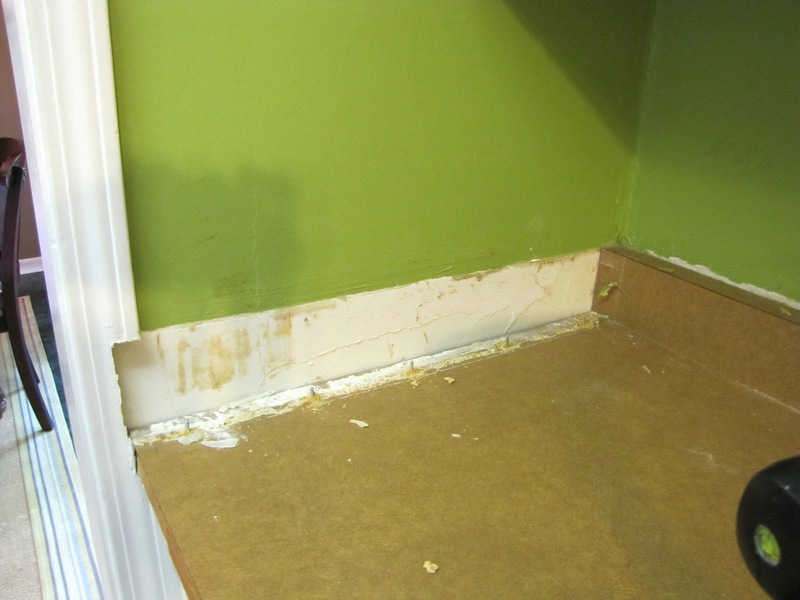 I hate to admit it, but my kitchen is worse than your before picture! I feel like I’ve taken a time machine back to the 1950’s every time I cook; it’s that bad! I spend most of my time keeping up with my job at Dish and the rest of the household, so my kitchen renovation aspirations have been neglected. I never knew it could be so easy though! Do you use any outside resources to help you out on these projects? My only go-to sources for DIY are HGTV and DIY Network. I record everything that has to do with sprucing up the house. 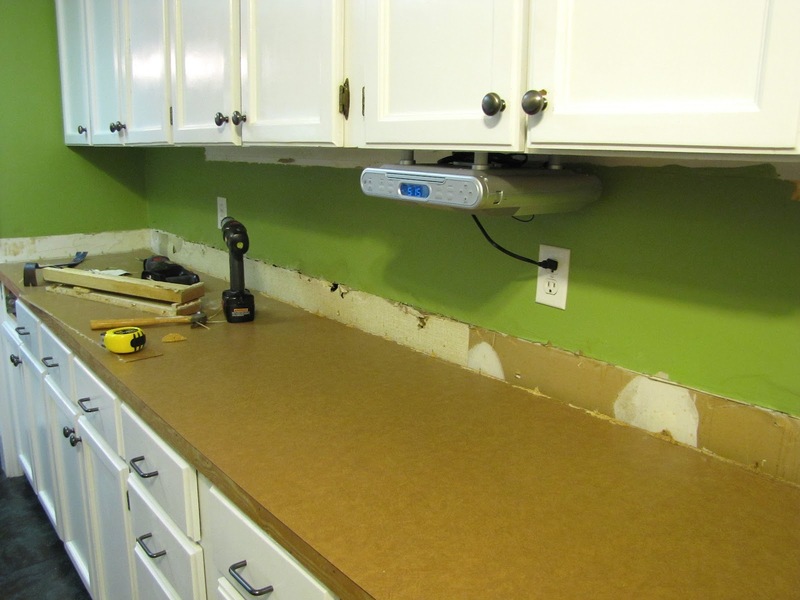 Luckily, I have the Hopper DVR with a huge amount of recording space because there are a lot of home renovation shows out there, but none of them make it look as easy as you did! Thanks for inspiring me to finally rescue my kitchen from being trapped in the past! Ooh, this is a definite improvement from the before photo! There really is a certain charm with white beadboards that brighten a room. I like how you put this tutorial together; it sounds easy and makes people want to try it too. Haha! Anyway, you did well with this DIY project. You were lucky you didn’t encounter problems with measurements such as protruding areas. Love the white beadboard backsplash! Seems so much easier than tile, and so fresh! I love your kitchen update! I'd love to pin it to The Home Depot Kitchens pinboard if you don't mind! The beadboard really suits your kitchen - beautiful! I've got this linked to my backsplashes post too today, for inspiration! Hi...I was wondering how your counter tops have held up with the process you used. 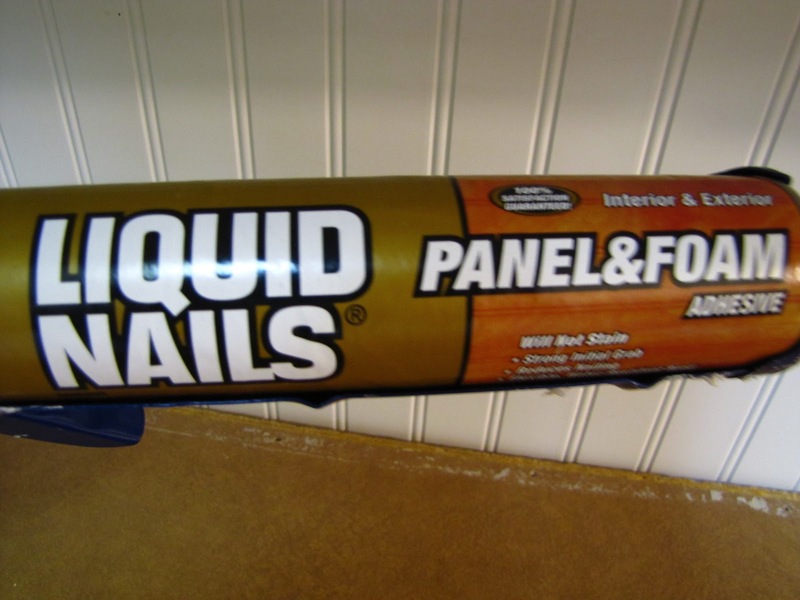 Also...did you use a sealer on your backsplash in the areas where there will be water? Hey! So far the countertops have held up fine! I did have one very small area that chipped after a very heavy and sharp edge of my skillet got dropped on it. It was hardly noticeable at all and I touched it up with the leftover paint I had and resealed that little area with poly. So far I am very pleased with the way it has held up because we are pretty hard on the counters. You want to make sure you prime them really well before painting. I think that's the key. 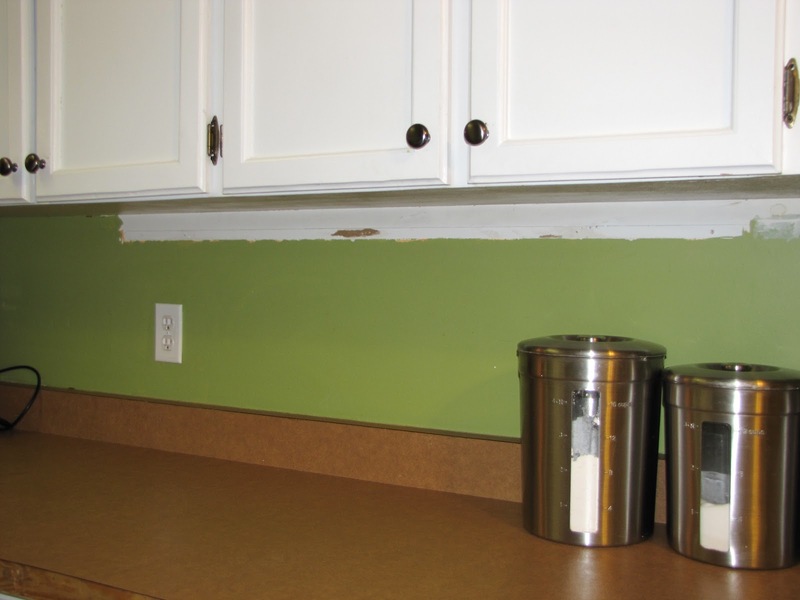 I used water proof caulk for kitchens to caulk around the bottom edge of the backsplash but other than that I did not seal it. Honestly the only area that ever gets really wet is right behind the sink. I do wipe it down with a rag if food gets splattered on it but that's about it. So the backsplash is holding up fine also. Thanks for reading! Thank you Liz! My favorite flooring would probably be a wide plank, dark stained hardwood. Thanks for reading! Love the bead board and have been thinking about doing this. My hesitation is cleaning...how easy is it to clean with all the grooves? 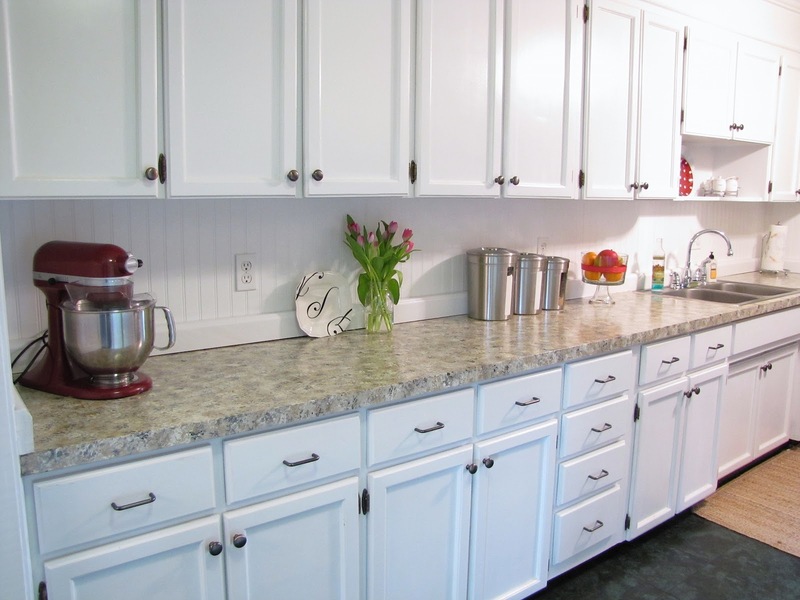 I love the beadboard backsplash and am planning to do that in my kitchen remodel. We are almost ready for that stage, but wondered how you finished off vertical edges that do not about door/window trim? Thanks! Thanks! You can purchase a small piece of trim from your local home improvement store for this if you want. I just caulked and painted it. Thanks for reading! It's not too bad. I just use a wet rag and vinegar when needed. Never miss a post! Sign up here.